The first week and a half of the expedition has taken me out of the San Juan Islands and westward through the Strait of Juan De Fuca. The coast in this section very rocky, with small cliffs lining most of the shore. There are also large sections that have flat stone shelves that stick out from the shore, covering and uncovering with the tides. These areas offer few places to land. Even small surf becomes plunging and dumps you right onto rocks if you get to close to shore. Because of these features the past several days have been mostly about staying in the boat for long periods, judging where to best catch the current, and making miles while the weather is good. I have spent a good bit of time at least a mile off shore, sometimes more, but it has paid off with great boosts to my paddling speed. It has been well-worth the 4 or 4:30am wake-ups several days in a row in order to take advantage of the ebbing tidal current. Watching the sunrise bright red between the clouds and the horizon has been beautiful each morning. It is a rare thing to be the only boat out on the water, quietly slipping past the coast as the world wakes up. I have also seen a lot of wildlife: countless seals, bald eagles each day, a large variety of ducks, and even some river otters. After one lunch break, a small seal followed me for almost a mile. It kept surfacing right behind my stern, made a sneezing-like sound, and then would dive with a loud splash. If I turned around to look, it would keep it’s head above water and lock eyes with me for several seconds, then dive and splash. Was it wanting to play? Fend me off? I’m not sure. It did seem small, though, maybe one of last summer’s pups. Mostly the days have been grey with occassional rain, but always beautiful layers of mist in the lush green hills along the shore. On one of these grey days I paddled out through the break at Jordan River at first light and caught the ebb current headed northwest again. As I rounded Sombrio Point, I felt ocean swell for the first time on this trip. I had been encountering some longer period waves since coming around the corner at Victoria, but those were most likely wakes from the giant container ships cruising in the Strait of Juan De Fuca. This was different. I looked up from the chart and noticed the entire horizon bending upward, then gently dropping as I was lifted up on the crest of that wave. It was unmistakably the ocean, so different than the smaller wind waves I had encountered up until that point. Two days later I landed on a beach just north of Carmanah Point, which is the place where the charts switch from marking the big water off the coast as “Strait of Juan De Fuca,” to “Pacific Ocean”. It is also more of a wilderness than the earlier sections, with no roads coming anywhere near the shore for a stretch of about 40 miles. 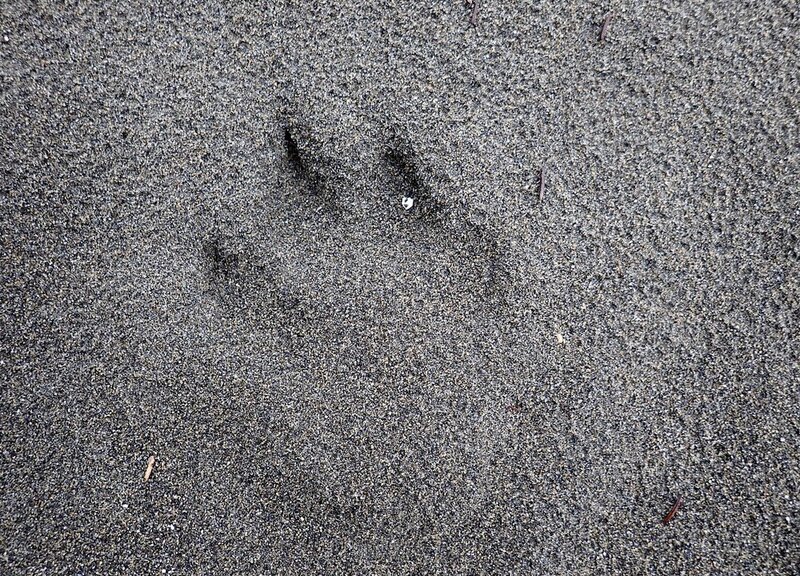 It was certainly feeling more wild than before: as I scouted the beach for a campsite I saw both wolf and bobcat tracks in the sand. I had not seen anyone else in a few days, just the wide horizon of the Pacific. Correction: They were actually Cougar tracks. Too big for Bobcat, and none on Vancouver Island. Thanks to JF and others for the help! There was also another tell-tale sign of having reached the ocean: big swell breaking on the beach as I got packed and on the water early the next morning. It turns out too big to leave. I spent an hour and a half getting tossed backwards by the breakers. After the fourth or fifth time getting surfed all the way back to the beach on an unexpectedly large set, I decided the ocean was trying to tell me something and I would be wise to listen. After setting up camp again, I climbed up onto a high rock outcrop and could finally see what was happening: huge closeout sets running the entire length of the beach were coming in every minute or so. They would rise up ten feet tall, curl over, and crash down with a booming noise that echoed around the small bay. These waves had been obscured when I was at my lower vantage point launching, but from up high it was so clear that my attempt had been in vain. I spent the next two days watching the surf and waiting for a chance to get back on the water. On the third morning I was able to break out! Now I am in Bamfield, having made it 144 nautical miles so far (about one fifth of the total). It is exciting to plan the next few days of paddling. I could see the big mountains up ahead as I rounded Cape Beale today. I’m excited to see what is in store for me further up the coast.